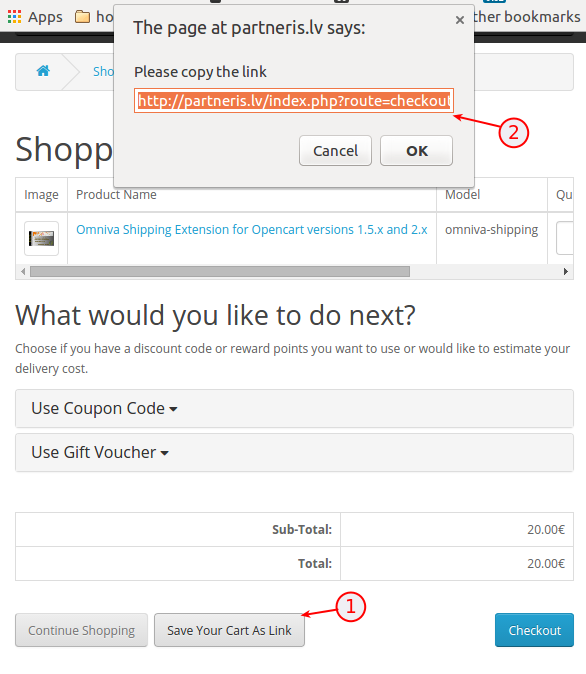 This OpenCart modification allows customer or store owner save all products in the cart as one URL. Anywone who will visit this link will be directed to the cart filled with the same products that were in it at the moment of saving. Save Cart As Link screenshot of cart page at the moment of generating the link. Upload save-cart-as-link.ocmod.xml file from the installation package. Go to Extensions->Modifications and click on Refresh button in top right corner of page. Nothing to configure - start using it. You should now see another button in the cart page. ejiet uz Paplašinājumi->Modifikācijas un klikšķiniet uz Atjaunot pogas lapas augšā labajā pusē.